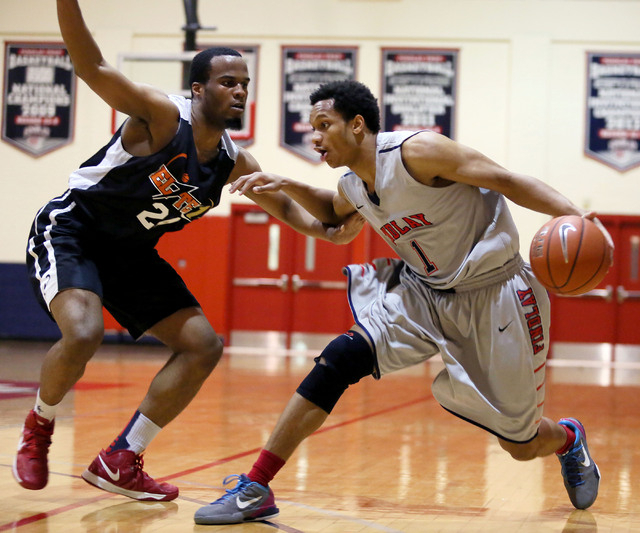 On the eve of his national TV appearance, Rashad Vaughn was unsure where he wanted to play college basketball. He pondered the positives of Kansas, Kentucky and North Carolina. 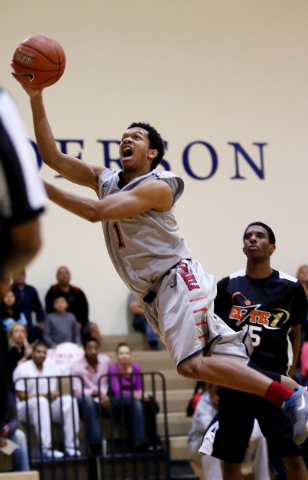 The Findlay Prep senior chose UNLV on Tuesday. He also considered Iowa State and UNLV. He talked to his parents and others in his inner circle. The Findlay Prep senior, nicknamed “Mr. Showtime,” put on a black bow tie, settled into a studio on the Strip and announced on cue his commitment to the Rebels. It was the latest in a series of big wins on the recruiting trail for third-year coach Dave Rice, who is putting together UNLV’s most impressive incoming class since the late 1980s. Vaughn, a 6-foot-6-inch shooting guard who has the ability to play the point, envisioned himself as the final piece to the Rebels’ puzzle. “With the pieces we’ve got and the team we will have next year, I feel we can win a national championship, and that was most important to me,” he said. Rice’s recruiting class ranks among the nation’s best. Vaughn, the No. 7 prospect according to Rivals .com, is the headliner. Dwayne Morgan, a 6-7 forward from Baltimore, and Goodluck Okonoboh, a 6-9 forward from Wilbraham &Monson Academy in Wilbraham, Mass., signed with UNLV in the fall. Morgan is ranked No. 15 and Okonoboh is No. 32 in the class of 2014 by Rivals. A McDonald’s All-American selection, Vaughn is averaging 20.0 points, 4.7 assists and 4.3 rebounds for the Pilots (25-4). He’s shooting 47 percent (56-for-118) from 3-point range. Findlay Prep has produced several elite players, including Anthony Bennett, who spent one season at UNLV before going No. 1 in the NBA Draft last summer, but Pilots associate head coach Andy Johnson called Vaughn the best shooter to come through the program. Vaughn expects to put the buzz back into a UNLV offense that has gone stagnant this season. The Rebels are scoring 71.1 points per game and connecting on just 32 percent of their 3-point attempts. “I can show the world my talents in that offense,” said Vaughn, who has attended several of UNLV’s games. Vaughn said he valued the advice of his mentor, Pete Kaffey, in the decision-making process. Kaffey was an assistant coach at Cooper High School in Minnesota, where Vaughn started his prep career, and is an assistant on the Findlay Prep staff. “I called my mom, my dad and Coach Pete, and we all just talked,” Vaughn said of how he made his choice Monday night. “I’ve got to do what’s best for me and my family. This is like home, so I just felt I would stay out here for college. The Rebels’ nonconference schedule in 2014-15 also appealed to Vaughn. UNLV is tentatively set to play Duke in the Coaches vs. Cancer Classic in New York in November, and will host Arizona and face Kansas and Arizona State on the road. “With the games next year, facing Duke, Kansas and Arizona, it kind of opened my eyes,” Vaughn said.